Capsule Hotel Bali - New Seminyak i Seminyak, Indonesien : Boka nu! Härlig stämning med mycket ensam-resande och roliga kvällar. Bra ställe att bo på om man vill träffa mycket folk. Fräscha rum och plus till god mat i restaurangen för bra pris! 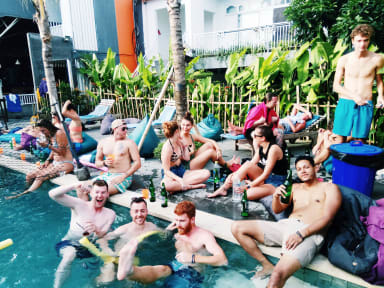 The best hostel in Seminyak! The atmosphere are over the top and the stuff, Iva and Deva are so friendly!! without doubt the best hostel i’ve stayed at so far during my 3 months trip! I have nothing bad to say about this place. The staff, the food, the vibe and the hostel itself is perfect. Everyone u meet is so friendly and the food is amazing. On top of everything, the beds is sooo Nice. You get 2 pillows and a real bed blanket not a towel. Yes it is a partyhostel But the noise stops around 12 so u can still have a Nice Sleep! So if u are in Seminyak and need a place to stay. This is it! Great atmosphere, only stayed one night unfortunately. Supernice breakfast and decent pool. Friendly staff and very social hostel, not hard to find a friend here. Al though it can be very noisy at night. The only thing I’m not happy with is the bathroom, other wise a very good hostel. Bra hostel om man vill festa. Sköna sängar och trevlig personal.